On this date 160 years ago at just a few minutes after 8am Elizabeth Martha Brown was hanged at the entrance to Dorchester Gaol…. I wrote this blog back in 2011, after a book I had just read about Martha Brown, by Nicola Thorne (Rosemary Ellerback) Martha was the last woman to be publicly hanged in Dorset, on the 9th August 1856, after being convicted of killing her husband John Anthony Brown. Public executions were abolished by law in 1868. …………….John Anthony Brown was born and baptised in Bettiscombe, Dorset..
Amazingly, five years on, I find we are living right in the area of Dorset where she was born, lived, loved and died. Her story is one that still has me hooked, and I still think is so sad and tragic for all concerned, especially Martha herself. I have added a few photos of places that are connected to Martha and her family. Top photo is a very old image of The Church of St Candida and Holy Cross at Whitchurch Canonicorum. Then left to right, a old view of Powerstock, then a distant view of Whitchurch Canonicorum, on the right is St Andrews Church, Burstock. This Church above is St Mary’s at Powerstock, where Martha married her first husband, Barnard Bearn on 27 December 1831..Before all her troubles began..If you are interested in family history or past times in Powerstock, they have a great project online with lots of old photos of the village…do take a look Village People..The Powerstock Project Martha was known as Elizabeth Martha Brown in her later years, although not born as such apparently, as no-one has yet found a baptism record for her. I do think from documents found online that she was born late 1811/early 1812, which makes her 44 as stated on Dorchester Prison records, when she killed John. The information and research was compiled after I had written the Blog below, over two years from late 2011 to April 2013, and is very detailed. So if there is anyone you want to find out about, who is connected to the case, most probably the details are here… Michael Russell, Dorset OPC has done a fabulous job !!! If you are able to access any Newspaper Archives, there are many accounts from around the country reporting on the murder itself in July 1856 and then Martha’s hanging in August of that year. I found lots of very detailed accounts by searching on Find My Past. When we went away to Cornwall recently we stopped to do a bit shopping in Devon, and had a mouch around a couple of Charity shops, where in one I picked up another book by Nicola Thorne, I had just finished reading ‘Daughters of the House’ and this one ‘My name is Martha Brown’ intrigued me. Once I started reading it I couldn’t put it down, it had me hooked. Nicola Thorne had written this fictional story about Martha Brown, based on the facts that she could find out about her in 1999. Nicola Thorne, real name Rosemary Ellerbeck spent about two years researching for this book. It is a fantastic story that she has written around the facts, and so believable. Martha Brown was the last woman to be hanged in public in the county of Dorset on a drizzly grey Saturday 9th August in 1856 just a few minutes after 8.00am. She was convicted of the Murder of her 2nd Husband John Anthony Brown who was 26 years old and about 20 years her junior. Here is a copy of his burial details from Ancestry. Note the asterix in the margin, and small note at bottom of page. She always denied murdering him on the 6th July 1856 and instead wove several tales and said that he must have been kicked by his horse and came home with the injuries. It was thought that her life would have been spared were it not for the conflicting statements she had made. Only just before her execution when she seemed to have ‘found religion’ did she actually confess to his murder, this is her statement that was published in Weymouth Journal – Daily News (London, England) on Monday August 11th 1856. “My husband John Anthony Brown, deceased, came home on Sunday morning, the 6th July at 2 am in liquor and was sick. He had no hat on. I asked him what he had done with his hat. He abused me and said “what is it to you, D..n you? He then asked for some cold tea. I said that I had none, but would make him some warm. He replied “Drink that yourself, and be D….d”. I then said ”What makes you so cross? Have you been at Mary Davis’s? He then kicked out the bottom of the chair that upon which I had been sitting. We continued quarreling until 3am, when he struck me a severe blow on the side of my head, which confused me so much that I was obliged to sit down. Supper was on the table and he said “Eat it yourself, and be d….d”. At the same time, he reached down from the mantle piece a heavy horse whip with a plain end and struck me across the shoulders with it three times. Each time I screamed out. I said” If you strike me again I will cry murder” continued…He retorted” If you do, I will knock your brains through the window”. He also added” I hope I shall find you dead in the morning”. He then kicked me on the left side which caused me much pain, and he immediately stooped down to untie his boots. I was such enraged and in an ungovernable passion, on being so abused and struck, I directly seized a hatchet which was lying close to where I sat and which I had been using to break coal with to keep up the fire and keep his supper warm, and with it (the hatchet) I struck him several violent blows on the head, I could not say how many. He fell at the first blow on his head, with his face towards the fireplace. He never spoke or moved afterwards. As soon as I had done it I wished I had not, and would have given the world not to have done it. I had never struck him before after all his ill-treatment but when he hit me so hard at this time, I was almost out of my senses and hardly knew what I was doing……… Signed Elizabeth Martha Brown. This is a couple of accounts that I have found on the internet about the hanging, the first one published at the time…….. EXECUTION at DORCHESTER – Of Elizabeth Martha BROWN — This morning (Saturday) a few minutes after 8 o’clock, Elizabeth Martha BROWN, convicted of the wilful murder of her husband was executed on a scaffold erected over the gateway of the new entrance leading to Dorset County Goal from North Square. The culprit did not up to the last moment, appear to shed a tear. She on leaving her cell, shook hands with the chief warder and other officers. On her way to the scaffold her demeanour was extraordinary. The attendants on either side were entirely overcome, whilst she bore her awful position with the greatest resignation and composure. The Chaplain the Rev. D CLEMENTSON, conversed with her on spiritual subjects, and she appeared to engage in fervent devotion and prayer, with her hands clasped firmly together and upturned eyes. On arriving at the place of execution she walked with firmness up the first flight of eleven steps. On this spot the ceremony of pinioning was proceeded with. Her female attendants here left her in the care of the executioner. Continued Rev Henry Moule [Vicar of St Georges Fordington] A cordial was then administered to her, a portion of which she drank. The pinioning being completed the culprit in company with the executioner then proceeded up the next flight of steps, 19 in number, to the platform and still walking with a firm step, crossed the platform to the next flight which led to the gallows, which with a slightly faltering step she then ascended in company with Calcraft. The Rev. Chaplain was unable to proceed further with her then the place of pinioning. He was most deeply affected, but the Rev. H. MOULE accompanied her to the platform. Calcraft then proceeded to place the fatal rope over the beam. Having drawn a white cap over the culprits face, he adjusted the rope around her neck and retired from the scaffold, he however appeared to have forgotten to tie the culprits dress and for that purpose re ascended the steps. having again retired he immediately drew the fatal bolt and instantly the wretched woman fell with great force and after a few struggles ceased to exist. At this moment the most intense excitement prevailed in the crowd. This is an artists impression of Martha’s execution. The gallows was erected over the gates of Dorchester prison the evening before, on what is today the prison car park in North Square and was a very impressive affair. A crowd of between 3 and 4,000 had gathered for, what was by then quite a rare event, the public hanging of a woman. To add to the public interest Elizabeth was an attractive woman, who looked younger than her years and had lovely hair. She was also incredibly brave in the face of death. So much so that her local vicar the Rev. H. Moule, regarded it as a sign of callousness. Rev. Moule accompanied Elizabeth to the gallows as the prison chaplain was overcome with emotion and unable to. She had chosen a long, tight fitting thin black silk dress for her hanging. At the prison gates, she shook hands with the officials and began the ascent to the gallows set up over the gateway. She walked up the first flight of 11 steps where William Calcraft, a forbidding figure in his black clothes and bushy white beard, pinioned her arms in front of her before leading her up the next flight of 19 steps, across a platform and on up the last flight of steps to the actual trap. 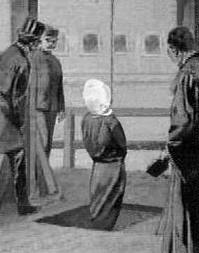 Here Calcraft put the white hood over her head and the simple noose around her neck. He then began to go down below the trap to withdraw the bolts (there was no lever in those days). When it was pointed out to him that he had not pinioned Elizabeth’s legs, he returned to her and put a strap around her legs, outside of her dress to prevent it billowing up and exposing her as she hanged. (The Victorian preoccupation with decency!) While this was going on, Elizabeth stood stoically on the gallows, supported by a male warder on each side just waiting for her death. The rain made the hood damp and it clung to her features, giving her an almost statuesque appearance. It must also have made it hard for her to breath through the damp cloth. Once again, Calcraft went below and pulled the bolts thus releasing the trap doors. Elizabeth dropped a foot or two with a resounding thud. Death was certainly not instantaneous and she struggled some and her “body wheeled half round and back”, according to Thomas Hardy (see paragraph below), taking a few moments to lose consciousness as the rope constricted the major blood vessels and put pressure on the nerves in her neck. She was left to hang for the regulation hour before being taken down and buried within the prison. Among the watching crowd was 16-year-old Thomas Hardy, who in a letter written 70 years later said he was “ashamed” to have been present, “my only excuse being that I was but a youth, and had to be in town at that time for other reasons … I remember what a fine figure she showed against the sky as she hung in the misty rain, and how the tight black silk gown set off her shape as she wheeled half-round and back”. The experience contributed to the writing of Tess of the D’Urbervilles, which ends with Tess being hanged for stabbing to death the man who ruined her. From what I have read it seems that no one is able to trace the birth of Martha Clark or actually if Martha (nee Hussey) and John Clark were actually her biological parents, they had quite a few children over the years, at least seven, some of whom the baptisms can be found quite easily William 1814 in Netherbury, Elizabeth 1819 in Powerstock, Charles 1821 in Thorncombe. It seems she could have been born between 1811 and 1816. In later years it seems she was known as Elizabeth Martha, but her first marriage to Barnard Bearn (sometimes found as Bern or Barnes) about 19 years her senior, it says just Martha Clark. Barnard was a widower, his wife Elizabeth (nee Mawson) having died in childbirth, he had a daughter Eliza born in 1822 and younger son James born in 1823. They married on 27 December 1831 in the church at Powerstock. 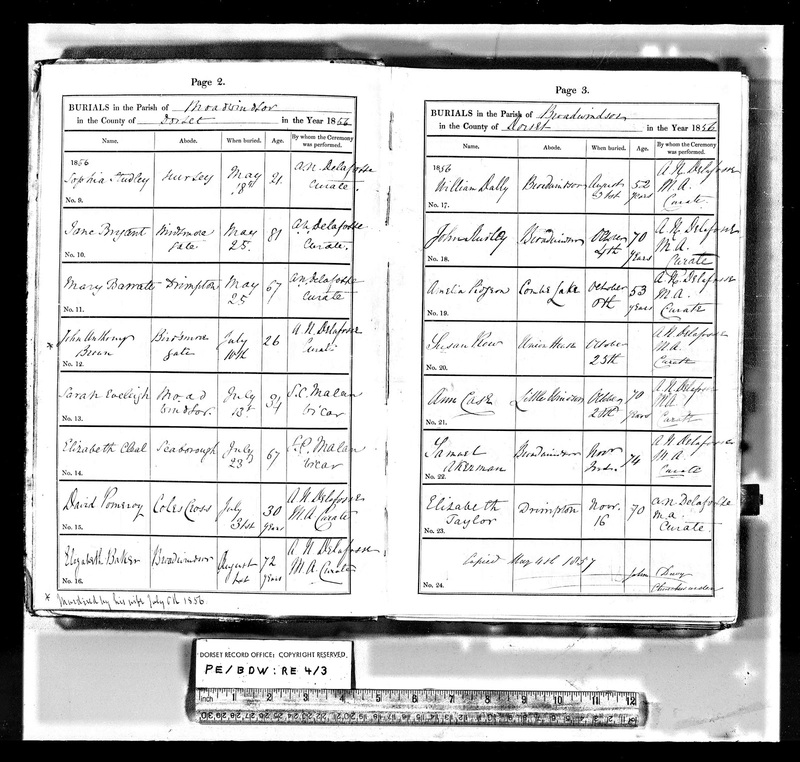 In the following year they had their first son William who was baptised on 25 December 1832 and then another son Thomas followed and Baptised on 8 February 1834, tragically both of their sons died in 1835 as a result of complications from Measles, both within 2 weeks of each other. That must have been so terrible, I just cannot imagine what Martha and Barnard must have gone through. But there was more to come, tragically Barnards son James died later that year too. Martha was left a widow in February of 1841, there is mystery surrounding his death , as his death is registered at Winchester, Hampshire, it seems he was taken ill while travelling and taken to the workhouse, where he died. In the next few years Martha made her living from being a housekeeper at Blackmanston Farm in Steeple, Dorset. This is where she met John Anthony Brown and married him at Wareham Register Office on the 24th January 1852, shortly after their marriage they left the farm and went to live in Birdsmoor Gate, it is said that John married her for the bit of money she had saved over the ten years she was working at the Farm. I don’t suppose his parents Robert and Frances Brown were too keen on him taking up with a woman so much older than him, but we can only speculate on that. Martha opened a small grocers shop and also the couple seemed to have cared for a child, a relation of Martha’s but nothing is known about whose child it actually was. The move was a tragic beginning to this final part of the tale of Martha Brown, as a lady called Mary Davis, someone else’s wife also had a Grocers shop nearby and John apparently took a shine to her…..and the rest is history………..John had given Mary a lift on his cart the day before the murder and Martha must have found out. My view is that I can’t help but feel sorry for her the way her life panned out, and we don’t know how bad a man John was to her. Nothing ever excuses murder at all, but…….well, we weren’t there were we? living her life…………End. These two images of the records recorded in Dorchester Prison, were only added to Ancestry in 2012 after I had written the above blog. The top one..No 129 entry, 10th from the bottom, shows Elizabeth Martha Brown Age 44 Committed (Inquest) on the 9th July 1856, admitted to Dorchester Gaol on the 10th July 1856…. Then the second image No 237..5th from the top of the page shows Elizabeth Martha Brown entry on the 18th July 1856 (Trial date) Offence..Murder..Sentence…To be hanged…Then ‘Executed Aug 9th 1856….